So that I could create the voice overs for my YouTube Channel, I got a microphone. Like all mics, this mic needed to be very close to my mouth so that it could pick up my voice with clarity. To do this, I needed a stand. Now I could buy one, but that would take out all of the fun. Also, a store bought stand would not get out of my way, leading me to get angry, and then I would have a broken microphone stand. 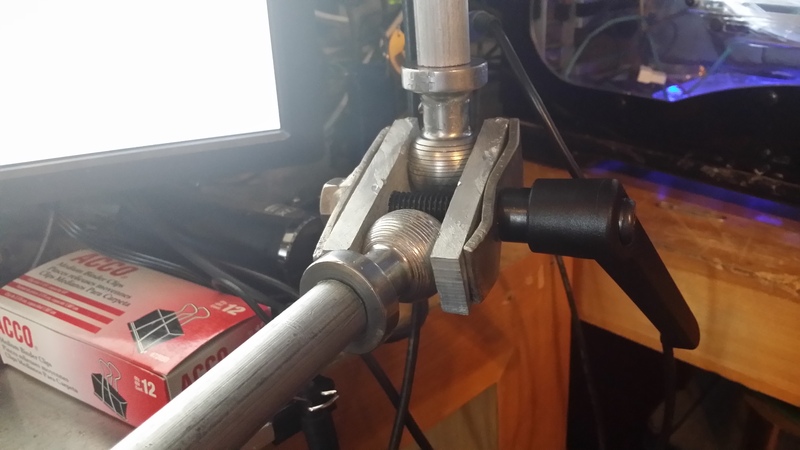 So to prevent the microphone from getting in my way I designed it to mount into my monitor stand. 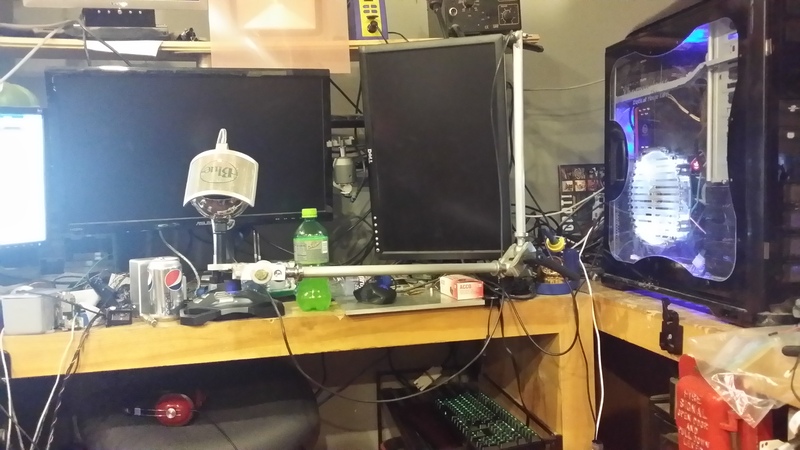 This is the other side of my monitor stand( it spans the entirety of my desk). 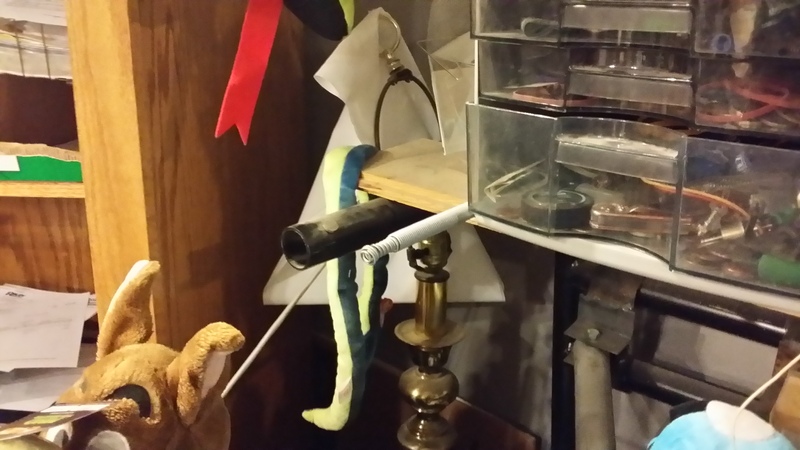 The tube sticking out is to support a shelf. This is where I am going to mount the mic arm. This is the mic arm. There is a bushing stuck inside the shelf tube. This bushing is attached by two 1/4″ bolts on either side (there the shiny bits on either side). 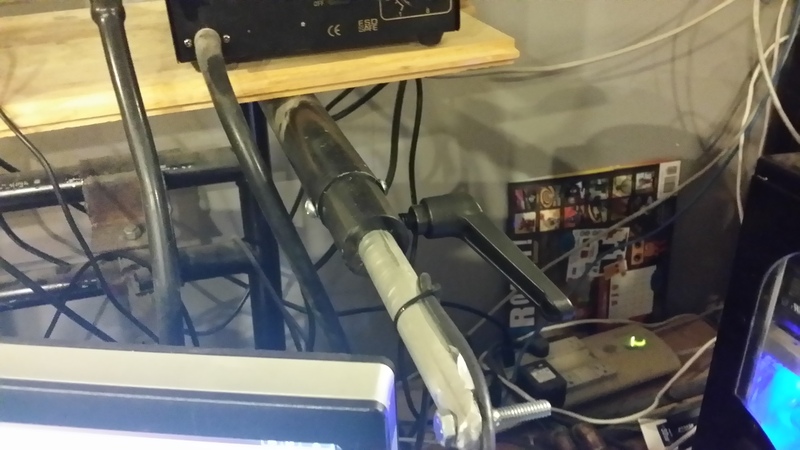 The mic arm is made out of 3/4″ aluminum rod. I chose aluminum for weight. This rod can slide in and out of the busing so that I can adjust the depth of the stand. To prevent unintended movement, I installed an Adjustable Handle; which is to the right. This handle screws into the bushing pinching the aluminum. I made this bushing out of a steel rod. Also, to prevent the rod from coming all the way out, hitting my tow, and then making me mad, I put a grove in the back of the aluminum rod and placed a C clip in the grove. This is the next joint. It allows the arm to swing up or down. It however doesn’t prevent the arm from swinging, so it is either straight up, or straight down. I made this joint by using an angle grinder to notch out the aluminum rod. Then I drilled the 1/4″ hole for the bolt. 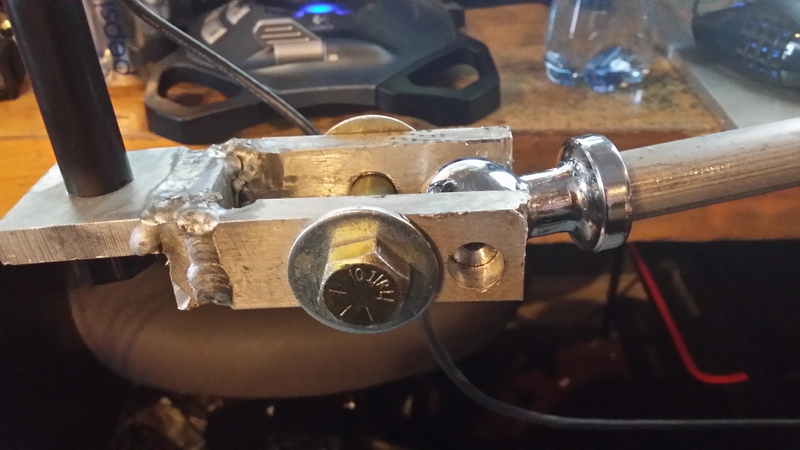 This was going to be my original joint for all of the connections, but as stated before, it can’t handle that much weight. It also didn’t allow enough freedom of movement. So I made the next joint a double ball joint. But where did I get the balls without having to make them? Amazon. They are a sway bar control arm ball. I cut off the threads, bored the center, and then taped the hole. 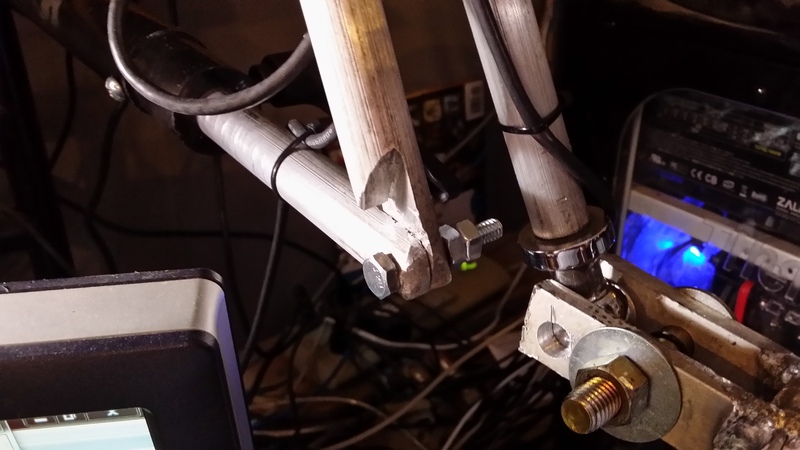 Then I turned down the end of the aluminum rod so that I could put 3/8″ fine threads on the rod. This allows the rod to screw into the ball. There are 4 plates. There are two aluminum plates with holes drilled in them. Aluminum will deform to the ball to increase friction. On the outside of the aluminum plates are steel plates. These plates have a kick in them to increase force at the ball. This also allowed me to weld a 1/2″ nut to the plate. Then I used a 1/2″ Adjustable Handle to allow me to easily adjust the pressure. To mount my Blue Snowball microphone, I just used the original base. Well, part of it. I unscrewed the feet, and just used the post to the aluminum plate. 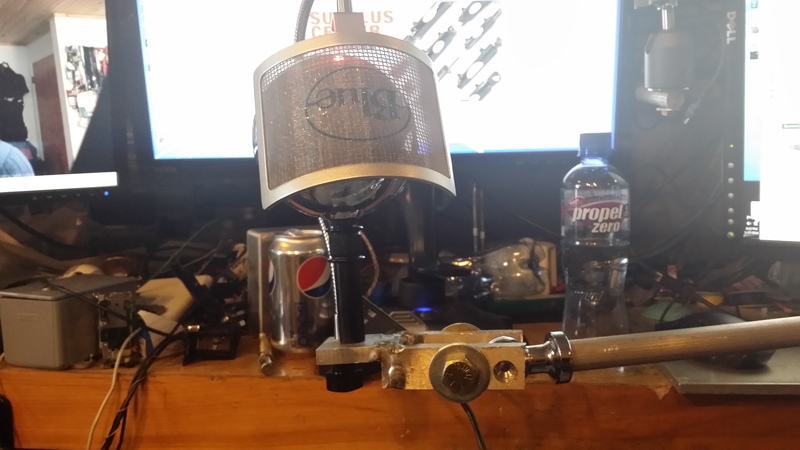 I also drilled a hole in the back of the plate to mount my pop filter. If you would like to see the build in more detail, please watch these two videos.